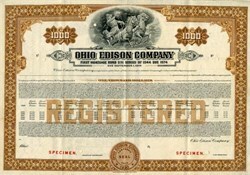 Beautifully engraved specimen certificate from Ohio Edison Company dated 1944. 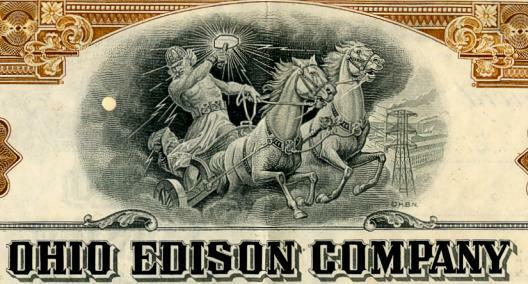 This historic document was printed by the Hamiliton Banknote Company and has an ornate border around it with a vignette of Hercules in a chariot with lightning and powerlines in the backgrounds. This item is over 62 years old. Ohio Edison Company distributes electricity to more than 1 million customers in central and northeastern Ohio. Ohio Edison, a subsidiary of FirstEnergy, also has 4,800 MW of generating capacity from interests in primarily fossil-fueled and nuclear generation facilities, and it sells excess power to wholesale customers. The utility's power plants are operated by sister companies FirstEnergy Nuclear and FirstEnergy Generation. The company's Pennsylvania Power Company provides nearly 160,000 customers in western Pennsylvania with electric service.